Bunny Gift Enclosure by Pink Peppermint Paper, LLC. 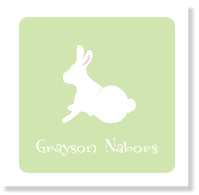 Description: Classic bunny silhouette in green. What could be sweeter? Great for boys or girls. Thanks for stopping by! We hope you'll find something you can't live without. I mean it's paper, but you get the idea. Pink Peppermint Paper's selection of gift enclosures and party invitations is unlike any other, featuring original artwork and often customizable to suit your color scheme. Use the provided wording or make it all your own.